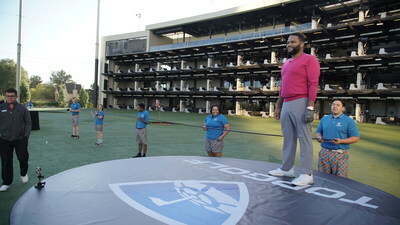 Anderson aimed to swing the longest useable golf club at 37 feet, 1 inch, for Topgolf's new original content episode, "Record Breakers"
DALLAS, Jan. 18, 2019 /PRNewswire/ -- Global sports entertainment leader Topgolf® launched its latest original video with a bang. The episode features Anthony Anderson, star of ABC's hit show "Blackish," attempting to break the GUINNESS WORLD RECORDS title for the longest useable golf club. "Anthony is a competitive guy, so he is really committed to crushing this GUINNESS WORLD RECORDS title," said Topgolf Chief Marketing Officer Brian Radics. "Topgolf had a blast working with Anthony, GUINNESS WORLD RECORDS and the rest of the team on this crazy attempt. We like to say that 'Big Hits Live at Topgolf,' so I'm expecting that this record will be a big hit with his fans." 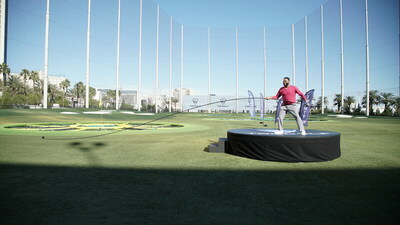 Anderson performed the stunt in November at Topgolf Las Vegas with a GUINNESS WORLD RECORDS Adjudicator on site verifying the attempt. A successful shot had to be performed with the club, driving at least 25 meters (82 feet, 1/4 inch). The episode, hosted by actor and comedian Jareb Dauplaise, also features a behind-the-scenes segment starring the "What's Inside" YouTube channel hosts, who showcase how the unique club was made. In addition, "What's Inside" covered the event in a unique video produced for its channel. GUINNESS WORLD RECORDS also documented the stunt in its own video. The longest usable golf club included a custom-made club head by Callaway and shaft by Fujikura. The 37-foot-1-inch club was made of specialized carbon fiber. "Record Breakers" is original content for Topgolf's YouTube channel that will show off crazy, record-breaking stunts. The episode is created and produced by Liquid Light. "Record Breakers" adds to Topgolf's growing portfolio of hit original content, including "Who Will Rock You?" and "Topgolf Chef Showdown." Check out full episodes at www.youtube.com/topgolf. GUINNESS WORLD RECORDS (GWR) is the global authority on record-breaking achievement. First published in 1955, the iconic annual Guinness World Records books have sold over 141 million copies in over 40 languages and in more than 100 countries. Additionally, the Guinness World Records: Gamer's Edition, first published in 2007, has sold more than 4 million copies to date. Guinness World Records' worldwide television programmes reach over 750 million viewers annually and more than 3.7 million people subscribe to the GWR YouTube channel, which enjoys more than 328 million views per year. The GWR website receives over 20.5 million visitors annually, and we have over 15 million fans on Facebook. The Guinness World Records commercial sales division provides customized consultancy services for some of the world's top brands and agencies to help place record breaking at the heart of their marketing campaigns, employee-engagement programmes, and live and experiential events. Beyond the venues, Topgolf fits seamlessly into the lives of our engaged community with emerging brands such as Topgolf Swing Suite, a luxury simulator experience; Toptracer, real-time tracking as seen on TV; Toptracer Range, bringing the tracing technology to driving ranges around the world; and WGT, the world's largest digital golf audience. As a growing lifestyle brand, Topgolf is discovering new ways to engage and delight our Guests through original content series, pop up social experiences like Topgolf Crush, and even through building music venues like The Cowan in Nashville.